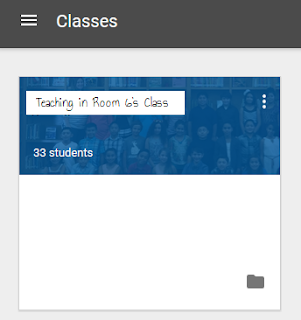 Google Classroom is something that has been around for a little bit. And, I am going to be honest with you, until this past week, I couldn't have cared less about it. I know. I am a blogger who uses technology in my own life on a consistent constant basis but in the classroom, I was lucky to get my ELMO to work long enough to play a little GoNoodle. However, this past week, I was in a jam. I needed the kids to type something up for our librarian and the computer lab was in use all week. I was faced with the prospect of checking out our chromebooks (which I am well aware of just how lucky I am to have access to three class sets of them), and typing on there. My computer teacher suggested we use Google Docs. So I checked it out and...my MIND WAS BLOWN. Since I am new to this, and maybe some of you are too, I thought I would start a blog series for you documenting my experiences with Google Classroom and all of the wonders it holds as I learn about it. Today's post is just about how I signed up and used the FREE service for the first time in my classroom. This is not everything, nor is it the be all, end all of Google Classroom, however it will help to get you started. The first thing you need to do is sign up for Google Classroom. It is very simple. Type classroom.google.com and it will take you to the site. Now, as far as I can tell, from playing around with my own email addresses, you need a school email to sign up. Once you are on, you can then create a classroom. Once that classroom is created, you can invite your students to join. They need an email address, which my students are assigned from the school district. We used those. They also sign on to classroom.google.com and enter the code for my class and automatically they are connected to me! How cool is that??? When they were assigned to me, this is what they saw. That's right. 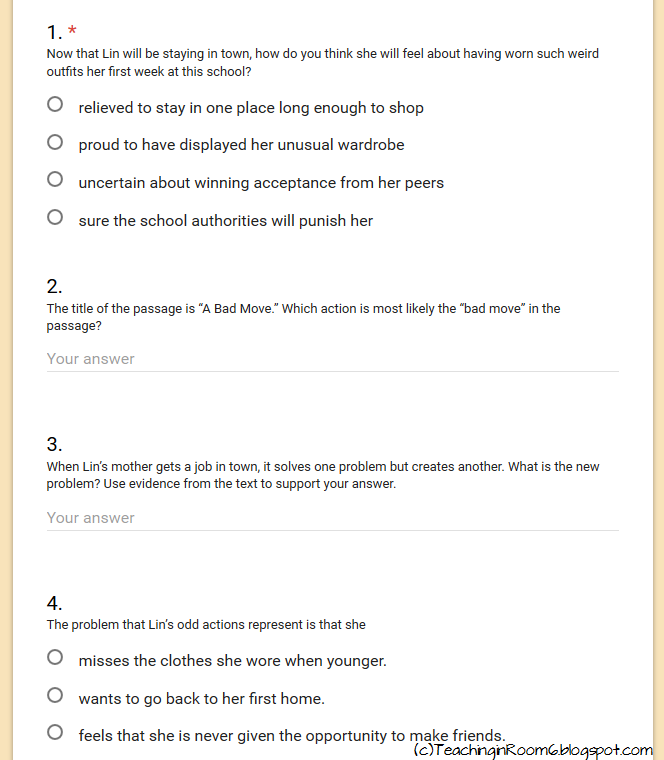 I had assigned them all a comprehension quiz to take. You see, the night before I had created that doc using a Google Form. 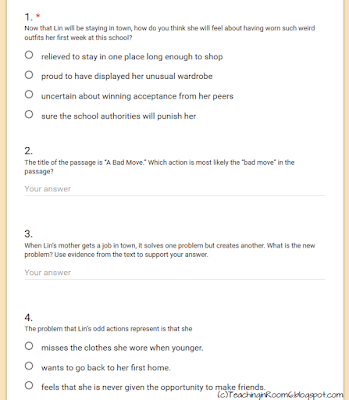 It let me input a reading passage, create questions, decide if I wanted them to be multiple choice or short answer, and then generate the test. I was able the to assign it to my class. Once the kids took the quiz and submitted the answers, I automatically received the answers in the form of a Google Sheet (which is just like excel). There is an app on the Google Sheet that helps to transfer the excel to a Google Doc (like Word) so I can easily read and grade the responses. Then, I can go back in and assign a grade to the test, so the kids can have their grades right at their fingertips. After giving just this one test, I am hooked and in love. I know there are SO many things I can do with Google Classroom (peer collaboration, shared writing, etc...) and that what we did is just the tip of the iceberg. I can't wait to see all that this has in store for us as the year goes on...and I can't wait to share it all with you. How do you use Google Classroom in your room??? I want to know everything so please share! 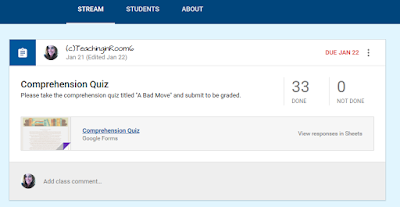 You may want to try Flubaroo add-on to your sheet after using forms to make your quiz. You take the quiz yourself. Add Flubaroo and it grades the quiz for you. Works well with multiple choice. 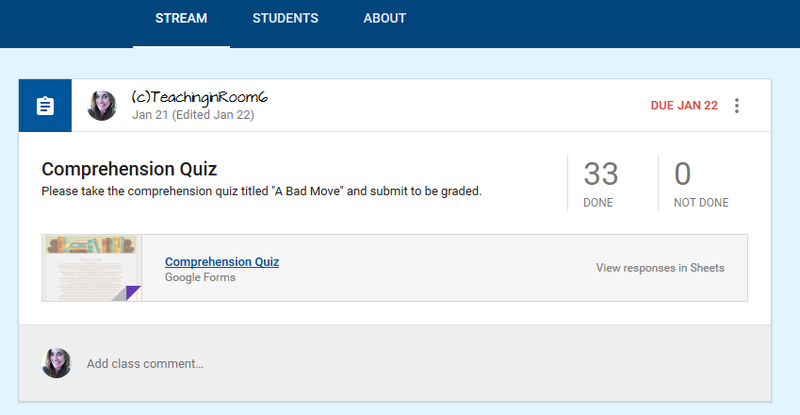 Score can be sent to student by email. Huge time saver and quick feedback for kids. Text answers are tricking if spelling varies. I teach a 4/5 combo and we have 19 chromebooks in our room. I absolutely adore Google classroom and do do my students! They beg me to put assignments on there. Their favorite is to assign any kind of research and allow them to make a slide show, we have researched storms, planets, Native Anericans, and so much more. We also type the majority of our essays. It has made them much more proficient at typing so they will be ready for the SBAC. We have used it for peer editing, and I will print out final drafts. They are easy to read because I don't have to deal with bad handwriting. I've also used it to attach links for videos or files I want the class to read. I have different classes for each grade so differentiation is easy. So excited to see your updates! My county will be getting Chromebooks next year and we're getting some GoogleDocs/Classroom/etc. training now. Thank you for sharing this! The school has to have a Google Apps for Education account in order for a teacher to set up Google Classroom. And I think the school has to have its own email address/domain. Correct me if I'm wrong. I was thinking the same thing as I read this. Definitely look into the add on of Flubaroo. It has changed my life! Does Google Classroom play nice on iPads?